How does driving a small truck around town sound to you? If you're looking to have great cargo space but not the bulkiness of a full-size truck, then consider the 2016 GMC Canyon. At Cutter Buick GMC Hawaii, you'll find everything you'll need regarding GMC trucks including the 2016 Canyon. Located at 94-149 Farrington Highway, Waipahu, HI, Cutter Buick GMC Hawaii serves Wahiawa, Kapolei, and Pearl City. For Starters the 2016 GMC canyon has an MSRP of $20,955 while the Toyota Tacoma has an MSRP of $23,300. 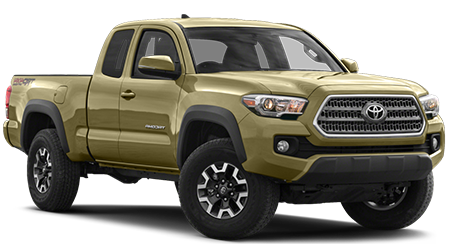 The MPG rating on the Canyon is 19 city /26 hwy while the Tacoma has a 19 city / 23 hwy. The GMC Canyon has a fresh-looking traditional design that has an amazing V6 engine. You'll love all the In-car wireless and other tech-features of the truck. Interior features of the 2016 GMC Canyon include a rear vision camera, power sunroof single-zone automatic air conditioning, remote vehicle starter system, steering column/tilt/manual, power door locks/windows, interior lighting, remote keyless entry,6-speaker audio system, AM/FM stereo with a 4.2" diagonal color system, jet black cloth seat trim, and an theft-deterrent system immobilization. Features of the Toyota Tacoma include air-conditioning with air-filtration, 6.1 LCD touch screen, AM/FM/ CD player with MP3 playback, six speakers, with Bluetooth wireless technology, leather trimmed seats, leather-trimmed shift lever, Analog instrumentation with speedometer, remote keyless entry system, power windows, power door locks, and an Auto-dimming day/ night rearview mirror with compass. The 2016 GMC Sierra has a warranty that includes 3 years/ 360,000 miles bumper to bumper warranty, 6 years / 100,000 miles corrosion protection, 5 years / 60,000 miles powertrain warranty, 5 years/ 60,000 miles roadside assistance program, and a 2 years / 24,000 miles two maintenance visit. The Toyota warranties include 35 months/ 36,000 miles basic warranty, 60 months/ unlimited distance corrosion perforation warranty, 24 moths / 25,000 miles maintenance warranty, 60 months / 60,000 miles powertrain warranty, 24 months / 25,000 miles roadside assistance coverage. At Cutter Buick GMC Hawaii you can expect amazing customer service and impeccable attention to detail. Cutter Buick GMC Hawaii is the type of dealership that focuses on relationships rather than sales quotas. When you're looking for an amazing deal on the 2016 GMC Canyon, consider Cutter Buick GMC Hawaii your premier dealership for shopping. Located at 94-149 Farrington Highway, Waipahu, HI, Cutter Buick GMC Hawaii serves Wahiawa, Kapolei, and Pearl City.